On the first day of the Los Angeles UTLA strike, a heavy rain fell on the colorful umbrellas and ponchos of California’s working class. Tens of thousands of teachers, school nurses and counselors, parents, students and community members marched from City Hall to the United Teachers of Los Angeles union hall. In reality, many didn’t make it all the way, as streets were clogged with Red-For-Ed supporters for many blocks. It was a busy day for strikers: 5 am picket duty; 10:30 am mass march; and then again, back to the lines ‘till 4pm. Across the city, public spaces erupted with the chant: U-T-L-A! Over 31,000 teachers have revived the strike weapon, which has not been used in almost thirty years by the UTLA. The last strike by LA teachers was in 1989, and before that, a strike in 1970 was central to the formation of UTLA. This fight-back by education workers is long overdue, and represents an important and welcome dose of class struggle in what has otherwise been a one-sided class war against working people. 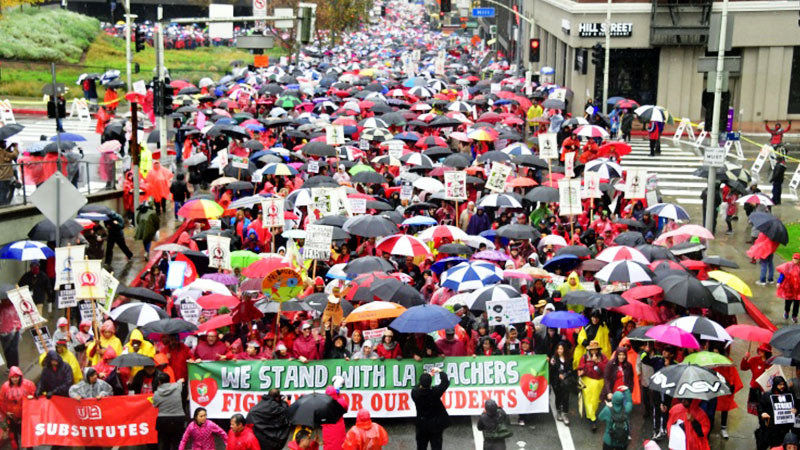 That upwards of 50,000 strike supporters braved the rain and cold shows the determination of Los Angeles teachers. The struggle for better schools has won the support of most parents and students. Many unions have also taken a stand with teachers — sometimes walking the picket in the best tradition of labor solidarity. Teamsters’ IBT Joint Council 42 has called on its local 399 members to “honor the picket line…join the picket line… and make it known that you stand with Los Angeles Educators.” Socialist transit workers initiated a solidarity committee that has mobilized workers to the picket line. ILWU dockworkers made their presence felt at schools, as have UNITE HERE members, Hollywood unions, and others. Unfortunately, some elements within the labor movement have found excuses to cross the picket line and undermine the teachers strike. The union officialdom of SEIU local 99, representing cafeteria workers, school bus drivers and other school staff, has shamefully told its members to keep on working unless 80% of a particular school formally votes to honor the picket line. Such labor misleaders see the world through the lenses of craft unionism and would rather betray fellow education workers than risk breaking the law or losing pay. Heroically, the most class-conscious elements within local 99 have organized their coworkers to go on sympathy strikes in at least 10 schools. Those sympathy strikers are leading by example and deserve our enthusiastic support. Today’s strikes are part of a larger Red For Ed rebellion for fully-funded, high-quality public education — a struggle started last year by teachers in West Virginia, Oklahoma, Colorado, Arizona and Kentucky. LA teachers have centered their fight around demands that would directly improve the lives of their students, (a majority of whom are working class Latinos), including smaller class sizes, better nurse-to-student ratios, more counselors, and greater restrictions on the expansion of charter schools. The union is also calling for an immediate 6.5% yearly raise — as opposed to the Los Angeles Unified School District’s 6% offer that would be spread over two years. 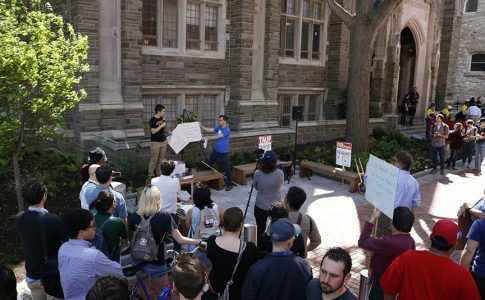 Teachers have pointed to the district’s almost two billion dollars of reserve funds as an obvious source for the urgently-needed resources and personnel the union is demanding. Despite being the fifth largest economy in the world, and despite the fact that companies headquartered there have been generating huge profits, California still has some of the most overcrowded classrooms in the country. The state spends roughly $70,000 per year for each incarcerated person in California’s massive prison system, yet LA is among the lowest in per-pupil spending in the country. Charter schools — which are undermining public education in general and teachers unions in particular — are more prevalent in greater Los Angeles than anywhere else in the country. These statistics illustrate the general trend: low-income school districts with large numbers of students of color are systematically underfunded. As many have observed, a key difference between the current UTLA strike and strikes by Mid- and Southwest education workers last year is the backdrop of local and state government. 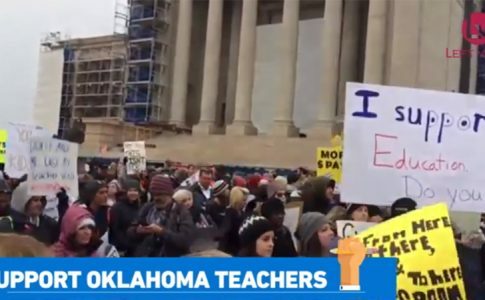 All of the teachers strikes in 2018 took place in right-to-work, Republican-controlled states. 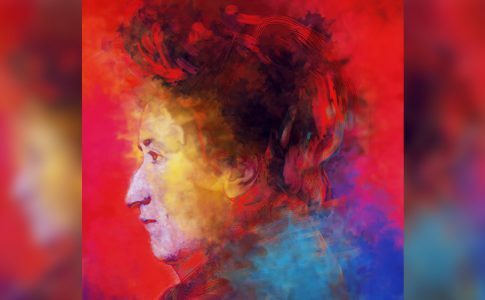 In West Virginia, for instance, many Democratic Party politicians positioned themselves as ostensible champions of the teachers, who just so happened to be fighting against their Republican rivals running the state. But in Los Angeles, Oakland, Chicago, New York and elsewhere, it’s not the Republicans pushing austerity or charter privatization but local Democratic Party officials. Much like the Chicago teachers who went up against the Democratic Party machine of Mayor Rahm Emanuel in 2012, LA teachers are making their charge against a long-time Democratic city administration. 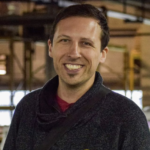 LAUSD Superintendent Austin Beutner – corporate billionaire with no business whatsoever running Los Angeles schools – was appointed by a Democratic Party-controlled Board of Education; LA Mayor Eric Garcetti is a Democrat, as is California Governor Gavin Newsom, sworn in just a week before the massive UTLA strike. LA, Oakland, Matamoros: Same Struggle, Same Fight! As the UTLA strike enters its third day, the rumblings of labor unrest have spread to Oakland, California, where teachers are facing similar issues and may also strike soon. 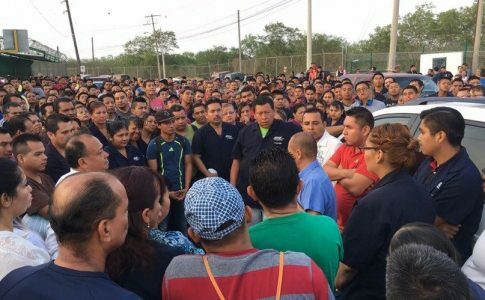 Meanwhile, hundreds of factory workers of the Mexican Maquiladoras (border sweatshops) of Matamoros have been on strike for over four days demanding unpaid wages, and in some cases, new, accountable unions. Their strike has affected 40 different factories in the border state of Tamaulipas. The same type of solidarity that animates UTLA picket lines must be extended to our brothers and sisters not only across the state of California, but internationally.